As you may have heard, marbled murrelet survey season is upon us. Already we’ve seen birds in some pretty controversial places, including all three of the parcels that the Department of State Lands has sold to private timber companies this year. As always, if you are interested in volunteering this summer give us a ring! On Saturday, June 21st, we’re having a plant illustration hike in the Elliott State Forest with artist and Coast Ranger Brittany. Spend the afternoon in a pristine forest while learning techniques for drawing and identifying plants. Paper, pens and graphite will be provided, but feel free to bring any preferred media. All ages and abilities welcome! Meet in front of the Bay Bridge Motel in North Bend at 11:00 am. 2 Responses to Upcoming Events in June! I missed the meet-n-greet. 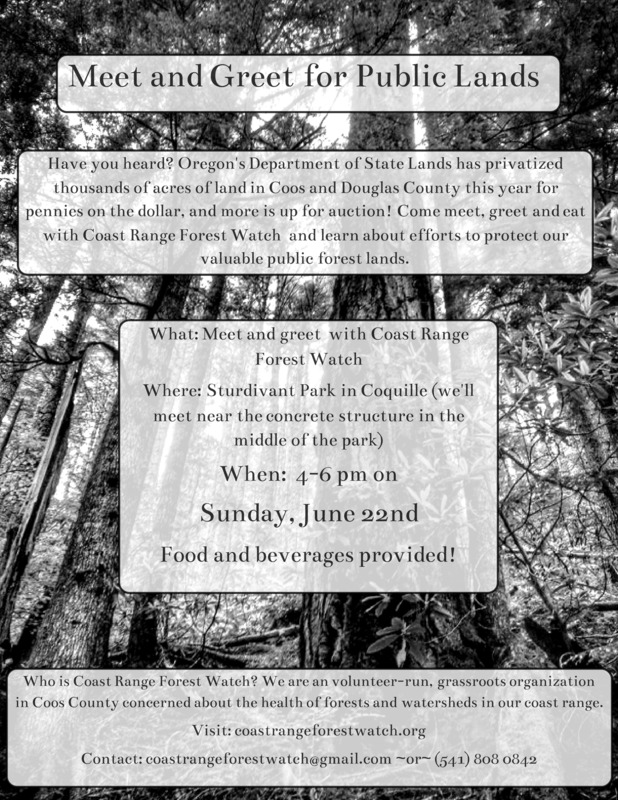 Can I get a summary of the efforts to protect our forests in Coos County? or will there be another event in the near future? Thanks! No worries, there will be a public murrelet survey day in July and more in town events soon. Check back on the website in the next day or two for the details on the murrelet survey day on July 19th. Hope to see you soon!